Meditation: Have you read the news today – the “good news” of Jesus Christ, the Son of God and son of Mary who was born for us and for our salvation. The word gospel literally means good news! Jesus’ birth in Bethlehem fulfilled the prophecy that the Messiah would descend from David and be born in David’s city, Bethlehem (Isaiah 9:6-7, 11:1-2; Micah 5:2-4). The first to hear the good news of the savior’s birth were not the rulers and religious leaders of Israel who were robed in riches and power. The angels first came to those who were humble and ready to receive the newborn king who was born in poverty and was now lying in a manger made for animals. Just as God had chosen and anointed David, a lowly shepherd of Bethlehem to become the shepherd king of Israel, so Jesus, likewise chose the path of humility and lowliness in coming to Israel as the good shepherd king who would lay down his life for their sake and salvation. After the angels had sung their hymn of glory in the presence of the shepherds, the shepherds made haste to adore the newborn king and sing their hymn of glory as well. Why was it necessary for the Word of God to become flesh? We needed a savior who could reconcile us with God. Throughout the ages Christians have professed the ancient Nicene Creed: “He became man for our sake and for the sake of our salvation.” The eternal Word became flesh for us so he could offer his life as an atoning sacrifice for the sins of the world through the shedding of his blood on the cross. The Word became flesh to show us the infinite love and tender mercy of God for us sinners. In the feast of Christmas we celebrate present realities – Jesus Christ our redeemer who reigns in heaven and who also lives and reigns in our hearts through the gift and working of the Holy Spirit. And we commemorate past events – the birth of the newborn Messiah King and his manifestation to Israel and to the gentile nations. We thank and bless God for the way in which he has saved us from the power of sin and the curse of death and destruction by sending his son to ransom us and give us pardon and abundant life through the gift and working of the Holy Spirit. Today we celebrate the birthday of our King and Savior, the Lord Jesus Christ. God wants to fill our hearts anew with joy and gratitude for the greatest gift he could possibly give us – his beloved son Jesus. What can we give thanks for in this great feast of the Incarnation? We can praise and thank God our Father for the fact that the Son of God freely and joyfully assumed a human nature in order to accomplish our salvation in it. Jesus came to release the captives from slavery to sin and to open the gates of paradise once again. 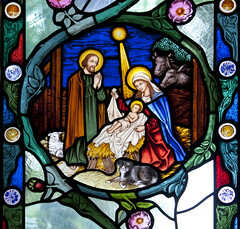 This day the Holy Spirit invites us to make haste – as the shepherds of Bethlem did – to adore Jesus our King and Messiah. The Lord Jesus Christ is our eternal good shepherd who guides and cares for us unceasingly and who gives us abundant everlasting life and union with the triune God – Father, Son, and Holy Spirit. This day the whole community of heaven joins with all believers of good will on earth in a jubilant song of praise for the good news proclaimed by the angels on Christmas eve: Behold, I bring you good news of a great joy which will come to all the people, for to you is born this day in the city of David a Savior, who is Christ the Lord (Luke 2:10-11). The joy of Christmas is not for a day or a season. It is an eternal joy, a joy that no one can take from us because it is the joy of Jesus Christ himself made present in our hearts through the Holy Spirit who dwells within us (see Romans 5:2-5). The Lord gives us a supernatural joy which no pain nor sorrow can diminish, and which neither life nor death can take away. Do you know the joy of your salvation in Jesus Christ? The Choir of King’s College, Cambridge is one of today’s most accomplished and renowned representatives of the great British choral tradition. It was created by King Henry VI, who founded King’s College, Cambridge in 1441, to provide daily singing in his Chapel, which remains the main task of the choir to this day. Today the choir is directed by Stephen Cleobury and derives much of its fame from the Festival of Nine Lessons and Carols, broadcast worldwide to millions on Christmas Eve every year, and the TV service Carols from King’s which accompanies it. This entry was posted in All Posts News Politics and-or Videos, Christianity, Dandelion Salad Videos, Music, Religion and tagged Christianity on Dandelion Salad, Christmas, Christmas on Dandelion Salad, Holidays, Jesus, Joy, Message of the Day, Message of the Day on Dandelion Salad, Music-Musicians-Bands on Dandelion Salad. Bookmark the permalink.